Home » Reading Experience » Reading Experience: Face it Tiger… You Just Hit the Jackpot! It’s arguably the most famous panel in Amazing Spider-Man history and quite possibly one of the greatest Marvel panels of all-time. “Face it tiger… You just hit the jackpot.” If only we knew how much of a jackpot Peter actually hit. Maybe it was all that talk I dedicated towards Peter’s current main squeeze Carlie Cooper that made me want to reminisce about how Stan Lee and John Romita Sr. unveiled Mary Jane Watson to the world in Amazing Spider-Man #42. For my money, it’s probably the greatest reveal I can think of. Readers had been teased about Mary Jane’s existence for years, being led to believe this woman, who was the niece of Peter’s elderly Aunt May’s best friend, would be some homely girl and instead she’s an absolute knockout. This girl was only going to get a pity date from Peter – despite the fact that he was hardly the BMOC at Empire State University – and instead she would go on to become the greatest love in his life. And of course it’s panels like these that inevitably make me reflect on what Stan and JRSR were possibly thinking when they made this reveal. 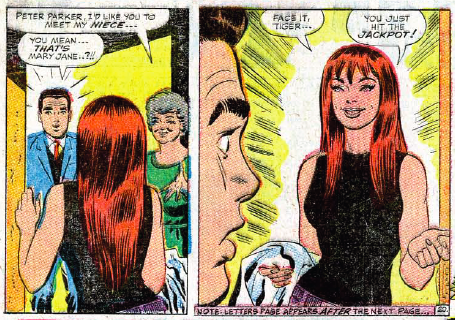 Did they always intend for Mary Jane to be such a fixture in Peter’s romantic life, eventually becoming Mrs. Mary Jane Watson-Parker? Did they predict that MJ would become such a beloved figure in the Marvel universe that some fans would be in a state of outrage when they decided to ultimately pull the plug on the Parkers’ marriage a few years ago? On first blush, I think not. While Mary Jane got the end-all, be-all of entrances, Peter was clearly smitten with the beautiful, blonde, Gwen Stacy. And even in the very issue where MJ debuted, Gwen was clearly being set-up to be more on Peter’s level in terms of intelligence and academic seriousness. MJ was always more streetwise and sassy, while Gwen was the ultimate girl-next-door with the brain. MJ’s upbringing was more dysfunctional, while Gwen had the distinguished father who was the proud captain of the NYPD. And while Marvel tried to play the Peter/Gwen/MJ interplay as a bit of love triangle for a few dozen issues, Peter and Gwen clearly became the serious “couple,” while MJ was experiencing flings with the likes of Norman Osborn. MJ would remain unserious until Gwen’s tragic death in ASM #121. So, in all likelihood it’s a bit of revisionist history that makes this specific panel stand out so many years later. A few years ago, readers of the great Comics Should Be Good blog even named it their favorite Marvel panel of all-time. And given the direction Marvel ultimately went with the character, who could argue? But I can’t imagine back in 1966, Stan and Romita thought their clever little joke would become so iconic. So while the current ASM creative team may be trying to convince us all about the worthiness of Carlie Cooper, it’s hard to get too invested when Peter has already been with a girl who got an entrance like this one. This post really makes me wish they continued the Spectacular Spider-Man Animated Series. They were clearly sticking with Gwen as Peter’s main girl with MJ as the sassy friend, so it would have been interesting to see just how closely they would have stuck to future source material. For what it is worth, readers already were told that Mary Jane was a knockout before she made her debut. Heck, they revealed that back when Ditko was still drawing the book. He just did not show her face at all (perhaps because Ditko really was not the guy who you go to when you want a “knockout” female character). They then get up the suspense of exactly what she looked like for a year and a half before the brilliant reveal. Initially, Peter thought that she might not be a bad girlfriend, because she didn’t get upset when he disappeared to do some crime-fighting. Ironic, because in the 1970s she became something of a scold, always criticizing him for not being around. Yeah, totally forgot about the stuff you’re all pointing out from ish 25 when I wrote this. Forgive me and don’t revoke my Spidey card?